Home News Bjorn Admits What He Did Best .. Getting Garcia’s Pick Correct. Bjorn Admits What He Did Best .. Getting Garcia’s Pick Correct. 6 months ago by Fatiha Betscher Comments Off on Bjorn Admits What He Did Best .. Getting Garcia’s Pick Correct. 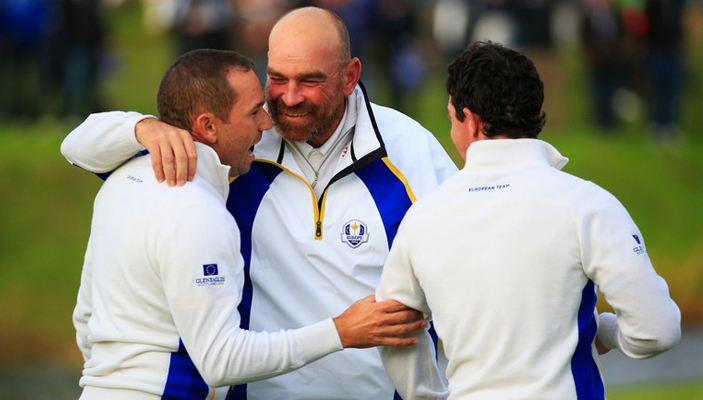 Victorious Ryder Cup captain Thomas Bjorn admits the best thing he got right ahead of his European Team’s stunning seven-point success in Versailles was selecting Sergio Garcia as one of his four ‘captain’s picks’ correct. Garcia’s selection drew plenty of controversy given the Spaniard had endured a horrid season including missing the cut in the four Majors and starting with his defence of the Masters. However, he did finish top-10 in the French Open and something Bjorn has now revealed was a key to his selection. And Garcia then went to France and delivered on a ‘plan’ both he and Bjorn discussed at length and winning three of four points for the European Team. “I think I got a lot of things leading into the Ryder Cup right and the way I dealt with my picks,” Bjorn said in an interview with Sky Sports TV. “Picking someone like Sergio was obvious controversial at the time as everyone was asking ‘why have you picked him?’ and things like that. “But I had some great conversations with Sergio and I sat him down and listened to what he had to say. I spoke to him how he saw those weeks leading up to the Ryder Cup were going knowing he is one of the best drivers of a golf ball in the world and on what is a very tight golf course. “It was also a golf course he had one of his best results of the season (T8th). “I looked at the guy and he informed me he had laid-out a plan that I felt like would make him play well enough to be in my Ryder Cup team and we needed players, and with five rookies in the team, who knew what it was and could stand-up to this great American team. “So, should I take a chance on him? “I didn’t feel like it was a chance because I felt he could bring so much good to the Ryder Cup and the team. There was so many conversations going on and I felt like it was a great plan for him to be at his best to secure three points out of three, so that was up to him to stick to the plan and then deliver. “But I felt they were some of the best conversations I had over the whole period and that made it work very well.